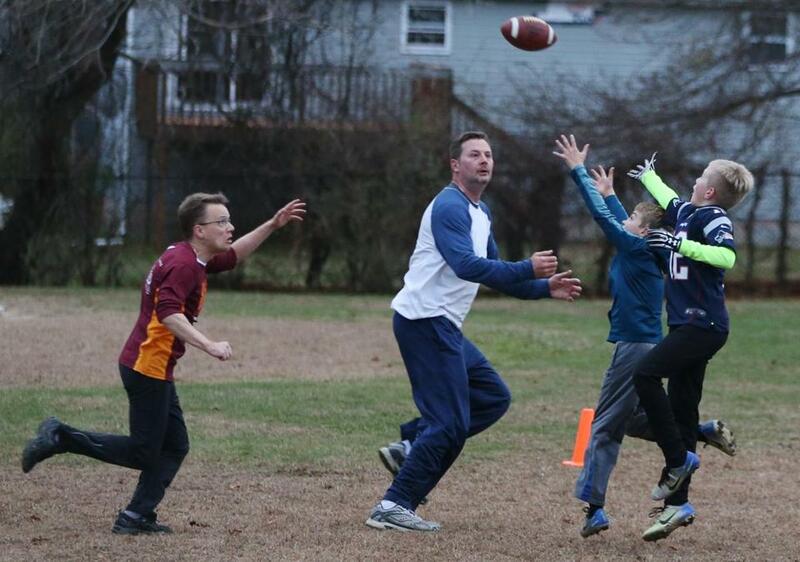 William Korinek, CEO of Astrocyte Pharmaceuticals, played tag football in Mystic with his two sons and friends. Korinek is cofounder and chief executive of Astrocyte Pharmaceuticals, a Cambridge startup trying to develop a drug to treat concussions. He knows about the long-lasting damage that repeated blows to the head can cause, and believes the game is especially dangerous to children under age 14 because their brains are still developing and necks are weaker than an adult’s. Despite growing public awareness of the dangers of repeated head impacts — including a strong correlation to the degenerative brain disease that afflicted Aaron Hernandez and other football players — no drugs have been approved to treat concussions. For the 2.8 million cases of traumatic brain injury that the Centers for Disease Control estimates are seen in US hospital emergency rooms each year, the main prescription remains unchanged: rest. Astrocyte is among several small startups experimenting with drugs that could be taken immediately after blunt head trauma in the hope of preventing or limiting damage. Other firms include San Diego-based Oxeia Biopharmaceuticals, whose chief executive is based in Boston, and Prevacus, which is in Tallahassee and whose CEO suffered a near-fatal head injury 23 years ago. Of course, the most devastating potential consequence is chronic traumatic encephalopathy, or CTE, a disabling condition that causes cognitive and emotional impairments. CTE can be set in motion days to weeks after a blow, even if the hit didn’t result in a loss of consciousness. Symptoms can appear years or decades after the last hit. Boston University researchers, who maintain a unique brain bank, have diagnosed CTE in 270 brains, including those of Hernandez, the former New England Patriots tight end who killed himself in prison last year at age 27. They have also found signs of the disease in the brains of deceased teenage athletes who had repeated hits to the head. Even people who never develop CTE can suffer debilitating symptoms as a result of a concussion. Those effects include temporary loss of consciousness, headaches, confusion, ringing in the ears, and nausea. Although usually short-lived, some symptoms can linger for weeks, even months. Doctors sometimes prescribe medicines off-label to treat traumatic brain injury, including Amitriptyline, an antidepressant that has shown some success in easing headaches. But the Food and Drug Administration has approved no drug specifically developed for concussions. Such medicines face multiple challenges, according to Dr. Sam Gandy, a neurologist and psychiatrist who runs the Mount Sinai Center for Cognitive Health and NFL Neurological Care in New York. For one thing, no two traumatic brain injuries are alike. Some jolts to the head cause nerve cells in the brain to twist. Others cause them to shear. Some blows prompt blood proteins and cells to enter the brain, causing further injury and complicating the potential for healing. Inflammation can provoke more damage by making the brain swell against the skull. Clinical trials of experimental drugs have invariably ended in disappointment. Among the best-known were two studies in 2014 of the hormone progesterone given to people immediately after acute traumatic brain injuries. The drug had shown promise in earlier human studies, but the late-stage trials, reported in the New England Journal of Medicine, found progesterone infusions were no more effective than a placebo. Still, researchers continue the hunt. Astrocyte, which was spun out of research at the University of Texas Health Science Center in San Antonio, is experimenting with a compound that invigorates astrocytes. Those are brain cells that Korinek said act as caretakers to neurons, which transmit electrical currents and provide the wiring for thoughts, memories, and motor function. When mice received the compound within an hour of suffering a blunt trauma, the astrocytes got the equivalent of a shot of caffeine, Korinek said. The caretaker cells did a better job of repairing other brain cells and reduced swelling. Astrocyte, which has five employees, hopes to start early-stage clinical trials in people in 2020, Korinek said. Wyand, chief executive of Oxeia, says his company is the furthest along of any firm testing concussion drugs. Oxeia is aiming to begin midstage trials in humans early next year of ghrelin, a naturally occurring peptide hormone. Ghrelin is produced mainly in the stomach and released into the bloodstream to other parts of the body, including the brain, where it has neuroprotective properties, Wyand said. Oxeia has obtained the rights to synthetic ghrelin from KineMed, a San Francisco area firm that filed for bankruptcy in 2016. It had proven safe in early-stage clinical trials as a potential medicine to increase lean body mass in people with muscle-wasting diseases, said Wyand. And it appears to increase the connections between brain cells in animals tested after concussions. The company is trying to raise $3 million in investments to start midstage clinical trials. Jake VanLandingham, chief executive of Tallahassee-based Prevacus, traces his interest in developing a medicine for concussions to a severe traumatic brain injury he suffered in 1995. As a 21-year-old college student, he said, he was punched in the jaw by a vagrant across the street from the University of Florida football stadium in Gainesville, for no apparent reason. “I dropped like a stone,” VanLandingham, now 44, said. VanLandingham suffered three blood clots in the brain and had short-term memory loss for 18 months, but he recovered and went on to earn a PhD in neuroscience and complete a postdoctoral fellowship in emergency medicine at Emory University in Atlanta. His startup is working on a neurosteroid. When inhaled nasally within minutes of a concussion, he said, the compound works on the molecular level to stimulate DNA sequences that lead to a reduction in inflammation, swelling, and other symptoms. It’s been tested on laboratory rats that have been given concussions, he said, and the rodents appeared to show improvements in balance, memory, and mood. VanLandingham hopes to begin clinical trials in humans next year.